Arctic Treasure is a five-reel 20 and pay lines developed by Playtech. Arctic Treasurer has an Arctic theme but with smoking hot payouts and cool features. The game doesn’t discriminate based on the size of the wallet like women do (I was under duress when writing this). The game has a flexible betting range and coin denomination that will accommodate players of all budgets. The coin denominations start as low as $0.01 to a high of $5. Since you are allowed to make only one coin bet per pay line, the minimum stake you can have is $0.01, and the maximum stake is $100. The lowest all-line bet size is a mere $0.20. With the numerous multipliers available in this game, it is highly recommended always to make the maximum bet. The symbols used in this game adopt an arctic theme. The most regular symbols are the Kayak, Owls, wolves, polar bears, and the traditional card faces; 10, Jack, King, Queen and Ace. Every symbol a special payout associated with it when you land three or more of a kind. Players have a lot to look out for. From the lucrative symbol combinations to the bonus rounds and dozens of free spins. 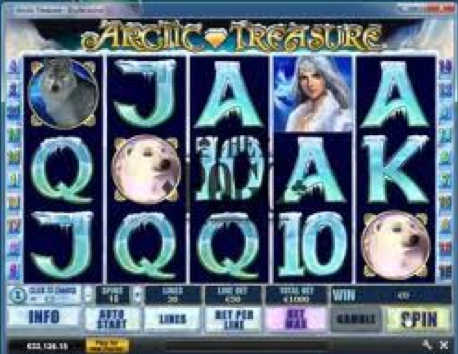 The Arctic Princes plays wild in the Arctic Treasure slot. The wilds in Arctic Treasure appear on any reel, 1-5. The Arctic Princes can replace all other symbols in the game except the scatter symbols. When you bag five Arctic Princes symbols on any active pay line, you will be rewarded you with 10, 000 coins. Arctic Treasure has a special bonus symbol; the Magic Pink Crystal. The symbol only appears on the 1st and the 5th reel. When you land two or more Magic Pink Crystals, you unlock the bonus round which is played on the second screen- inside an Ice palace. In this round, a player is presented with a set of crystals to choose from. The crystals reward up to 150x multiplier on the initial bet prize. Arctic Treasure has an Auto-play feature for players who want just to watch the reels spin or players who are not in the mode to click (an excellent way to describe a lazy person). With this feature, you set the bet price and choose the number of spins then click “Play”…. the computer will proceed to do the ‘dirty work’ on your behalf. However, you cannot accelerate the speeds of the reels in Arctic Treasure. What Do You Do When You Win Big? Hot and Cold Pokie Machines?